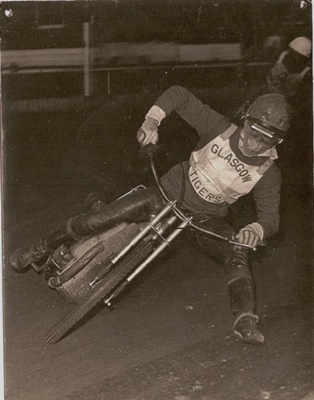 More from Peter Colvin's excellent vintage photographic series - as featured in the Glasgow Tigers programme. 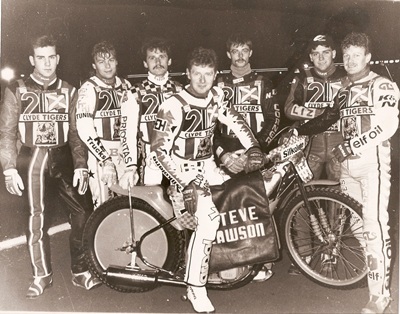 This is the much-changed Glasgow team that faced Edinburgh Monarchs for the first meeting of the 1992 season at Powderhall Stadium on 27th March. Left to right is James Grieves, Tim Korneliussen, Robert Nagy, Steve Lawson, Robert Csillik, Mick Powell and Neil Collins. This was the first leg of the Spring Trophy. The Monarchs winning the meeting by a narrow eight point margin. Neil Collins was, by far, the best Tiger on the night with an immense 16-point haul from six rides. Mick Powell was next best with 10 points from the same number of rides. Steve Lawson scored 6+1, Robert Csillik 4+1, Tim Korneliussen 4, James Grieves 1 and Robert Nagy failed to score from three rides. Just two of the Glasgow side, Steve Lawson and Mick Powell, were retained from 1991. Out of the squad went Kenny McKinna, Martin McKinna, Shane Bowes, Mark Courtney, Sean Courtney, Jason Lyons and Brian Nixon. This photograph, taken by Alf Weedon, appeared in the first issue of Speedway Pictorial dated 12th May 1965. The caption that accompanied the picture said it all:- "The man everyone is talking about. The challenger for Barry Briggs' British Match Race Championship. The fantastic Charlie Monk. Glasgow's pin-up boy. Here's Charlie showing just the sort of form that has made him one of the British League's top box office attractions." The photograph was taken the previous month at White City when the Coventry Bees, who had finished second in the National League in 1964, lost their sting, and hence the meeting, by a 34 point margin. The night ended with Charlie Monk not only scoring a maximum, but also reducing Ivan Mauger's track record by 1•3 seconds. He finished the season with a 10•22 average in what was the best league in the world. 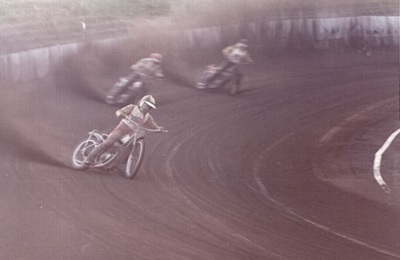 This image captures the straight-leg technique that was so characteristic of Charlie Monk's style of riding. This is the legendary Australian rider Ken Le Breton, 'The White Ghost' of the Ashfield Giants 1949-50. He was one of a trio of big names in Scottish Speedway during the boom post-war years. 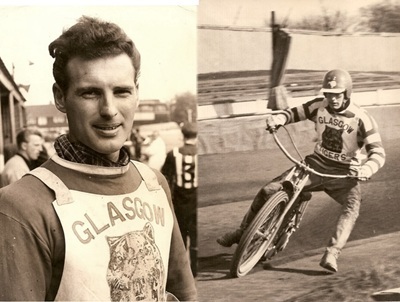 The others were Tommy Miller of Glasgow Tigers and Jack Young of Edinburgh Monarchs. Ken Le Breton first rode in the UK wearing the colours of first division New Cross Rangers on 3rd May 1947. After two matches, he was transferred to Newcastle who were then racing in the second division. In 1949, the Giants were formed when Johnnie Hoskins moved the Newcastle side north to Ashfield Stadium. Here was a brand new track and brand new club. It proved to be the launch pad that projected Ken Le Breton towards speedway stardom. His progress that season was such that by September he was the only second division rider in the World Final line-up at Wembley. He died in January 1951, following a crash at Sydney Sports Ground. The new banking, now in place at Ashfield, has been compared with the track at Cliftonhill Stadium in Coatbridge, home of the Tigers from 1973 until the middle of 1977. I have chosen this action shot in order to give some indication of the superelevation that was built into the circuit when the track was constructed by the Edinburgh promotion prior to the 1968 season. This snapshot was taken during the Scotianapolis individual meeting in 1974 and shows Phil Herne sweeping round the fourth bend in Heat 6. Behind him, trying to find grip high up on the track, are Chris Roynon and Doug Templeton. The top Tiger in 1973 was Jim McMillan. This is what he said of the track:- "There was grip and you could use the banking to pass. I used to run up [to] the boards and use the banking to chop down to pass on either side of the bends." This is Bruce Ovenden, a tall Kiwi who joined the Tigers in 1964 when the Glasgow side were part of the Provincial League. 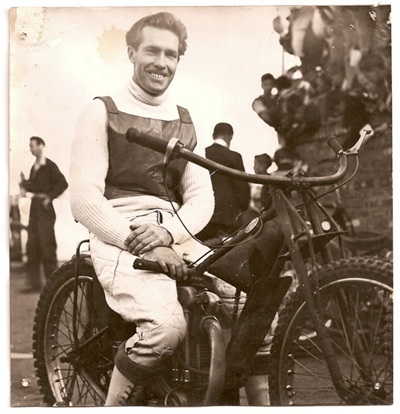 He first rode a speedway bike at Waiwakaiho Speedway, New Plymouth before coming to Scotland along with Joe Hicks. Bruce remained with the Tigers for the following season when he rode in the newly formed British League, finishing with an average of 4•71. He never returned to the UK after getting married during the close-season. Bruce spent most of the early part of 1964 partnering Charlie Monk. This is what he said of his team-mate:- 'Even though I rode with him a lot we never really talked much. I tend to take people as I find them so it didn't worry me at all. He was a dedicated win machine, and very hard to make friends with.' Bruce would not have seen much of his partner in his first home meeting at White City in 1964 because he fell in his first ride and damaged his bike. On borrowed machines, Bruce failed to score in his remaining heats. "Love the story on The White Ghost, Ken Le Breton. "